The master bedroom at our project in Sydney Street, Chelsea is situated on the first floor, the high ceilings and beautiful original cornicing gave us a fantastic space to work with. We emphasised the large floor to ceiling windows with luxurious linen curtains and sheer roman privacy blinds to maximise the easterly light. The property is grade 2 listed which meant certain features had to remain including the fireplace in this room. We built this panelled head board to conceal the fireplace and allowed us to use wall mounted bedside lights as seen in the photograph above. The master en-suite was designed to feel opulent and romantic. We used faded pattern tiles on the floor and marble on the counter and splash back. The elegant roll top bath is the main feature in the room and site in front of the original open fire place. We built bespoke linen cupboards either side of the chimney breast which we distressed with chalk paint to give an authentic antique appearance. The basin counter was built with plenty of storage and under hung basins to give a clean look to a classic style. 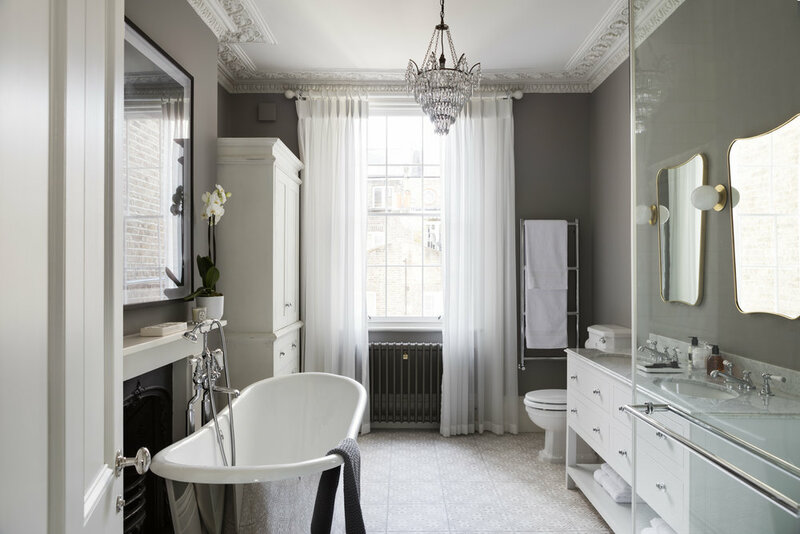 The Gubi wall mirrors add an extra elegance with a more modern shape to this traditional bathroom and the CTO wall lights update the over all look.